After introducing Nokia 1 , HMD Global made a surprise in the Indonesian market by presenting Nokia 6.1 Plus . Yes! As we know, Nokia 6.1 Plus is another name for Nokia X6 which is only marketed in China and is present to target middle class consumers. Having a contemporary design, Nokia 6.1 Plus is packed with a bangs screen. That said, this is Nokia’s first smartphone that has bangs. Another attraction is the back dual-camera support and this smartphone is included in the Android Oneproject . HMD Global mixes Nokia 6.1 Plus with a 5.8-inch IPS LCD screen . However, the resolution of this smartphone is still HD + even though the aspect ratio is 19: 9. To protect the screen, HMD Global also has a 2.5D curved Corning Gorilla Glassprotection . Bangs at the top of the screen that are quite striking are allocated to load the front camera, earpiece and some supporting sensors. The bottom bezel contains the Nokia logo without any navigation buttons that are now pushed into the screen. Aimed at the middle class, the body behind Nokia 6.1 Plus has been wrapped in glass material with aluminum frames. There is dual-camera support plus an LED flash positioned vertically in the center. Just below it is a fingerprint scanner sensor and also the Nokia logo and Android One. To spur the entire Nokia 6.1 Plus machine, HMD Global seems confident enough to embed the Snapdragon 636 chipset as its brain. The CPU installed with Octa-core 1.8 GHz Kryo 260 is integrated with GPU Adreno 509 . Meanwhile, HMD Global also supplies this smartphone with 4GB of RAM paired with 64GB of internal storage. No need to worry, this smartphone is also equipped with a microSD slot that can accommodate additional data up to 400 GB. What about the power supply in this smartphone? Nokia 6.1 Plus comes with a standard capacity battery, which is 3,060 mAh . Other supports included include USB Type-C, OTG, 3.5mm audio jack, and Bluetooth 5.0 . Nokia 6.1 Plus comes with dual-camera rear support. The dual camera configuration installed has a 16 MP resolution with an aperture of f / 2.0 + 5 MP as a secondary lens that has an f / 2.4 aperture. HMD Global also equipped it with dual tone flash. To fulfill the desire of selfie enthusiasts, Nokia 6.1 Plus has also been equipped with a front camera that has a 16 MPresolution. To produce more optimal selfies, the front camera is also supported by an f / 2.2 aperture and 1.0um pixel size. Besides being supported by dual-camera rear and hardware support that is no less interesting, Nokia 6.1 Plus also still has other selling points. Yes! This smartphone is included in the Android One project initiated by Google and the embedded operating system is the truly pure Android Oreo . 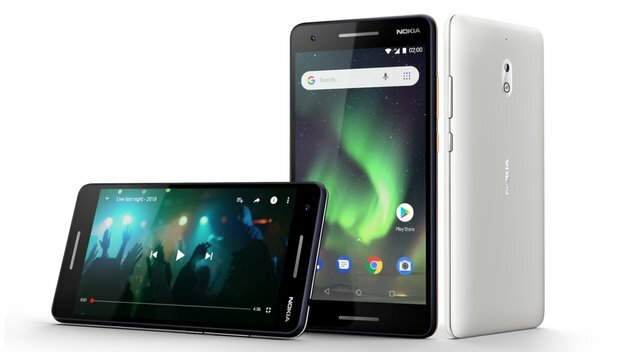 Marketed in Indonesia, Nokia 6.1 Plus is available in three color choices, namely Gloss Black, Gloss Midnight Blue, and Gloss White. Want to know the price and be interested in buying it? HMD Global sells this smartphone for Rp.3,399,000through Blibli.com and Dinomarket.com.